If you’re looking for an owner’s manual for your DB5, or a barn-find Aston Martin to restore, where do you head? You could trawl the internet, get on the phone to the specialists or traipse around countless autojumbles. Or, alternatively, you could attend the annual Aston Martin sale. 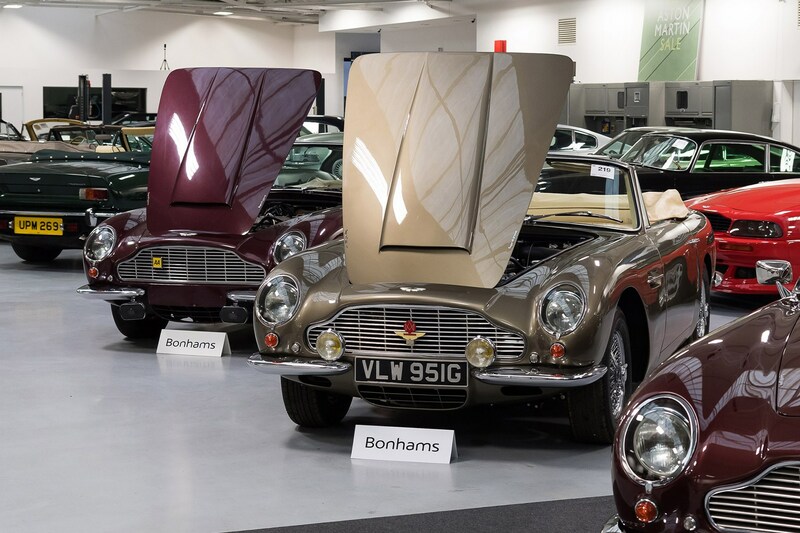 It’s hosted at the company’s Works facility in Newport Pagnell, and auctioneers Bonhams carry out the sale of countless Aston-related lots. From complete restoration projects through to pin-sharp examples, and everything in between, numerous cars are offered. As it’s hosted by Aston and Bonhams, the auction also tends to attract some of the most desirable and attractive lots – as well as countless items of memorabilia, including signed Bond posters, ex-development projects and spare parts. Despite the high-end classic car market weakening recently, as evidenced by numerous cars making nowhere near their estimate, and some not selling at all, there was still strong competition for certain lots. A 1955 Lagonda 3.0-litre Drophead Coupe, for example, sold for £89,420 including fees – more than double its top estimate of £35k. Clearly at least two people really, really wanted that one car and were willing to go above and beyond to acquire it. This DB2/4 was reputed to be a lovely car to drive, with a strong engine, rewarding handling and excellent brakes. It was also in fine fettle otherwise and came with three binders full of paperwork that documented its history – including a comprehensive breakdown of its extensive restoration. It was eligible for the Mille Miglia and other events, too. A sharp, elegant classic that’s completely sorted and ready to compete? Sign us up. A usable and collectable classic Aston? This Series 2 DB4 appeared to fit just that billing, thanks to a host of modern touches – including the fitment of power steering. It also benefitted from a factory-fit overdrive, upgraded cooling system and electronic ignition, among countless other upgrades, making this classic DB a fine tourer. It even came with the appropriate and smart-looking vanity plate, as well as an extensive history folder, rounding the package up neatly. Not cheap, though, by any stretch. Okay, so at a glance this might look worth steering clear of – but bear with us. This ’66 DB6, in desirable Vantage specification, hasn’t been touched for 25 years – hence its downbeat appearance. However, it was reputed to have covered only 15,707 miles and, outside of its weathered exterior, appeared pretty solid. A comprehensive restoration would return it to impeccable condition and you’d likely easily recover the cost of the work back – and then some – with the resulting uplift in its value. Alternatively, and what we’d prefer, you could go through the structure and mechanicals, buff the paint and let that hard-earned patina continue to thrive. If you were looking for something that was perfect from nose to tail, then you wouldn’t have gone far wrong with this DBS. It had been on the receiving end of a full nut-and-bolt restoration, which also resulted in it being returned to its original colour and trim combination. More prominently, it also benefitted from – brace yourself – a £28,000 engine rebuild. Its V8 promptly thundered out 342bhp and 399lb ft on the dyno, meaning this DBS really had the muscle to back up its looks. Now someone’s done all the hard work, and spent all the required on it, it would be a great car to pick up and enjoy. This was unquestionably the star lot of the auction for most. This works racer was one of just 30 made and, uniquely, was built for Sir David Brown’s personal use. It went on to race in myriad events and was driven by the likes of Sir Stirling Moss, Graham Hill and Roy Salvadori. It even appeared in School For Scoundrels, alongside Terry Thomas. Alas, it appeared it wasn’t the DB3S’s day, despite its eligibility for events like the Mille Miglia. The hammer fell at £5 million and, seemingly, the car remained unsold. Perhaps it’ll pop up at another auction house in due course.